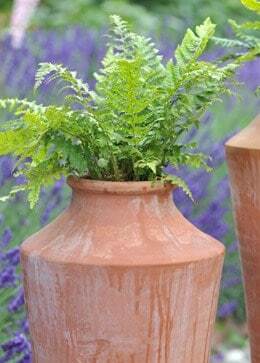 If you have a shady spot that needs livening up a bit, this this oil pot and fern combination might be just the ticket. The fern is evergreen, so will hold most of its foliage throughout the year, although to keep it looking its best, it is worth cutting in back hard in spring, when the new foliage is just starting to emerge. That way, you get to admire the great shuttlecock-like shape it creates. When planted up into the accompanying frost-resistant, hand-thrown oil pot, it looks like a cute topknot, popping out of the top, but as the summer progresses the foliage relaxes and the overasll effect is softer. 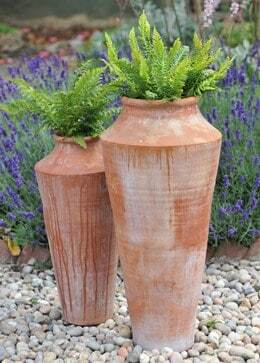 The pot is 60cm height and 28cm wide, so big enough to create an impact, and slender enough to fit easily into a corner or beside a doorway. Garden care: Ensure that the plant is kept well watered - particularly in warmer weather and feed with a balanced slow-release fertiliser during the growing season. Cut back tatty foliage in spring.